Our wargaming interests are not restricted to Napoleonic wargaming, but cover Ancients, Medieval and World War 2 as well. Our preferred scales are Napoleonic 15 & 20mm, Ancients/Medieval 15mm and WW2 20mm. We'd love to get in touch with other wargamers in Singapore, and if any travelling wargamers are in town, please contact us at napnuts@yahoo.com. If you're just visiting our website, please feel free to look around. You can also join our free Discussion Forum. If you are new to the hobby, click on the Beginners' Guide button to find out more about wargaming. You can also download our free sets of wargames rules to get started. Feel free to contact us if you have any questions. Make Napnuts Your Home Page! We launched our Malayan campaign game on the 60th anniversary of the Fall of Singapore! Click on the relevant links for more info. Click on image for Singapore's weather Have you checked out our Napoleonic uniform reference yet? We have uniform painting and organisation guides for Napoleonic French, British, Prussian and Austrian armies. Click here to take a look! An interesting scenario - the Merville Battery raid on D-Day by British paras and a successful second test of our CF/SL hybrid rules. 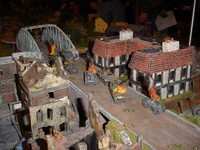 Click on the glider for the scenario details and battle report. Forth Eorlingas! The Battle of the Fords of Isen - The first in our Lord of the Rings series. Click on the White Horse of Rohan for maps, suggested order of battle and our battle report. Check out our Masters of the Mediterranean - Ancients campaign. Click on the pic to get the rules and map. A rare find by one of the Napnuts - the long-lost Diaries of Captain (Dr) Arjun Khan of the Bengal Army Medical Corps - detailing his adventures in the Soudan and other far-flung reaches of the Empire! Click on Captain Arjun to read Book One of the Lost Diaries! The Napnuts Ancient Rules - Conqueror of the Ancient World - are almost ready for publication. Take a look at some of our final playtest pics here. Cool gifts! Visit this website to order customized handpainted porcelain. The thumbnail shows a coffee mug handpainted with two British Napoleonic Light Infantrymen. Napnuts Gallery Launches! Check out the best Napnuts tanks, figures and terrain! 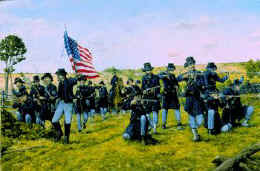 Free ACW Rules by Napnut Steve Holmes. These are fast-play battalion-level rules which can also be used for any late-19th Century engagement. Buy Napnuts Merchandise - visit our Online Store!